Being a server means serving God and his people. That is what makes serving worth doing, and worth doing well. Serving allows us to be close to the Table of the Lord and gain a deeper understanding of the mechanics and the spirituality of the Mass. In Heaven, the Holy Angels perform the task of the Altar Servers. Who we are: We are “St. Thomas’ Angels”, faithful members of St. Thomas the Apostle Parish, called to minister at God’s altar with reverence, dignity and love, creating a prayerful atmosphere during the service and working to help other people to worship and to make their love for God stronger. Time commitment: We arrive at the church 15 minutes before the scheduled Mass time to prepare ourselves and the altar for Mass. Requirements: Anyone from the 4th grade or older. 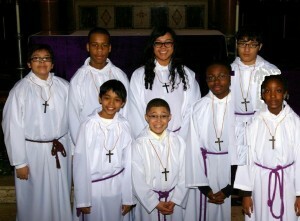 The Altar Server ministry is a wonderful way for young people of all ages to serve our Lord and deepen their devotion and appreciation for the beauty of the Mass.